Lost diver by playa rocks in Cozumel. 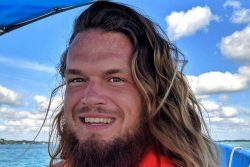 Cozumel.- Cameron Donaldson, Sports Diver with extensive experience based on the island was reported missing by his own mother with whom he was diving this afternoon through the area of playa las rocks, North of the city. Port authorities coordinated by the ensar of the secretariat of Marina (Semar) Armada of Mexico already lead the search for it, although the alert was passed to anyone who moves by sea in various activities in case of placing it on the sea. Through friends and family, it was reported that the mom returned to land and explained that about four hours ago decided to separate under the water, but after a while not to locate it decided to give part to the authorities to request the help. Specialists In Nautical and aquatic water said that ” Cameron Donaldson has a lot of training and experience, in fact he likes to dive into the beach, so it is very possible that he dragged the current to the north. Maybe this one for the island of passion or returning to the center “. “if the currents did not leave him then he was invited to the channel between Cozumel and the continent” added. It also transcended that the experienced sports diver wore a submarine propellant (Scooter) so it is believed that he should have returned without problems to land. However, in case you were floating someone will rescue you, “if it is not a test more than we have always been against local divers, not to do beach diving to go to the wall”, in reference to the cantil From The Island. Founder and Master Moderator of Divetalking.